At this year’s NORML Conference, which was held the first week of October, much emphasis was placed on the upcoming legalization initiatives in Washington, Colorado, and Oregon. 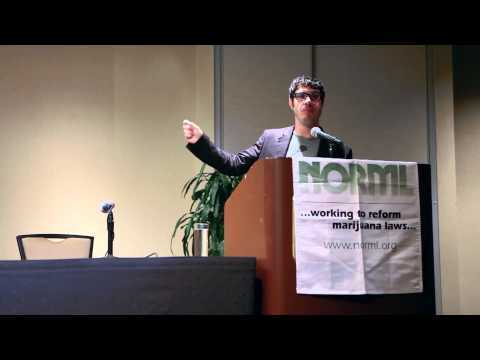 One of the featured speakers was former NORML Board Member and writer for The Stranger in Washington, Dominic Holden. Dominic delivered an impassioned speech defending Washington’s marijuana legalization initiative, I-502, and spoke at length at the importance of winning initiatives and how we can progress towards full legalization in America. “The first [complaint of the opposition] is they don’t like a provision…that says if you have 5ng active THC in your blood for every mL of whole blood then you are guilty of DUI. What the opponents have been saying, is that someone who has used marijuana, a regular marijuana user…a medical marijuana user, will test positive for exceeding that level a day later, two days later, a week later. Well guess what? They don’t have a single f***ing scientific study to back them up. In fact, the science proves them wrong. What science shows is the vast majority of marijuana users drop below that 5ng level within a few hours and none within 12-24 hours and certainly not a day later, two days later, a week later. Their argument is fundamentally flawed, because it’s a lie. Expect much more video coverage of this year’s NORML Conference in the coming days and be sure to visit www.newapproachwa.org to learn more about the effort to tax and regulate cannabis in Washington State this November. Recent polling data released by the Boston Globe has Massachusetts’ Medical Marijuana Initiative, Question 3, winning by a landslide. A survey of 502 likely Massachusetts voters, conducted between September 21 and September 27, has support for Question 3 at 69%, with just 22% opposed and 9% undecided. Every single demographic has majority support for the ballot question, with the lowest being Republicans at 51% and the highest being Democrats at 78%. Take note presidential candidates, self identified Obama supporters back the initiative by 76% and Romney supporters by 51%. The people are ready for legalized access to medical cannabis, why aren’t you? Read more information on the poll here. Learn more information about cannabis and the 2012 election by reading NORML’s voter guide, Smoke the Vote.